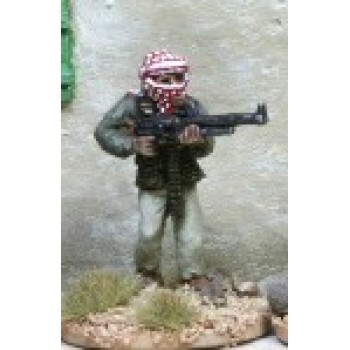 20mm Modern Elhiem x3 Insurgents a shirts and trousers armed with AKM wearking balaclavas. Reworked ..
20mm Modern Elhiem x4 Insurgent Command wearing shemagh. One armed with the much prized AKSU, 2x wit..
20mm Modern Elhiem x4 Bareheaded Insurgents w/AK47s in civilian clothes with heads and faces uncover..
20mm Modern Elhiem x3 Insurgents Chechen/Arab/Foriegn fighter armed with LMGs. Wearing a mix of Russ..
20mm Modern Elhiem x3 Insurgents Chechen/Arab/Foriegn fighter armed with RPGs wearing a mix of Russi..
20mm Modern Elhiem x1 Insurgent Chechen/Arab/Foriegn fighter armed with SVD Drugnov sniper rifle wea..
20mm Modern Elhiem x5 Insurgents a mix of Russian/western and Arab clothing and equipment armed with..
20mm Modern Elhiem x2 Insurgents a mix of Russian/western and Arab clothing and equipment armed with..
20mm Modern Elhiem x10 Mix set of Insurgents in Shemaghs. May include duplicates..
20mm Modern Elhiem x2 Insurgents with 1x in Shemagh and 1x bare head with bomb vests running..
20mm Modern Elhiem x2 Insurgent Technical Gunners with 1x PK (pictured) and 1x DHSK on poles. Guns w..
20mm Modern Elhiem x4 Insurgents with AK47s in Shemaghs..
20mm Modern Elhiem x4 Insurgents with RPG7s in Shemagh head scarves..
20mm Modern Elhiem x3 Insurgent bare headed insurgents for the ZPU AA gun GUN-27..